What is the short circuit rating on a 10FR4042? The FlexPak 3000 10FR4042 has a 500A short circuit protection rating. What does a field current regulator kit do on a 10FR4042? A Field Current Regulator kit for a 10FR4042 will replace the standard field excitation supply on the 10FR4042 with a current regulated supply. It will provide field economy and constant horsepower operation for the 10FR4042. For a full description of the field block, you can view the Field Current Regulator kit manual. Manual D2-3336. What does the F00016 fault code error mean on the 10FR4042? F00016 is the fault code for phase loss on a 10FR4042. When this fault appears on the 10FR4042, it means that the measured AC line voltage on the 10FR4042 drive fell below 75% of the value specified by nominal AC line volts on the 10FR4042. What is the acceleration time on a FlexPak 3000 10FR4042? The default acceleration time on a 10FR4042 is 5.0 seconds. To adjust the acceleration time on the 10FR4042, adjust parameter P.001. The parameter has a range of 0.1 to 300.0 seconds on a 10FR4042. 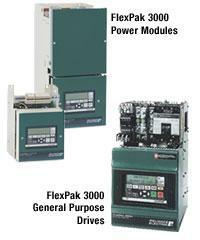 10FR4042 is a regenerative 460 VAC FlexPak 3000 drive that is manufactured by Reliance Electric. F00011 is the OIM Communications Timeout fault, which means that the operator interface module was unable to communicate with the regulator board. F00012 is the Armature Overvoltage fault, which means that the armature voltage exceeded 130% of the motor’s rated armature volts. F00030 to F00041 are the SCR #n NOT OPERATING faults, which indicates which thyristor is not operating. F00042 is the Multiple SCRs Not Operating fault, which means that one or more thyristors is not carrying an equal load. F00060 is the Self Tune Abort by External Cause fault, which means that self tune was aborted by the external input. F00061 is the Non-Zero Speed Feedback > 1 Second at Start fault, which means that there is non-zero speed feedback at the self tune start. F00062 is the Calculated Armature Inductance Out of Range fault, which means that the calculated armature inductance is out of range. F00063 is the Maximum Current with Minimum Rotation fault, which means that the drive is running at the maximum current and the minimum rotation. F00064 is the Calculated Inertia Out of Range fault, which means that the attached inertia is out of range. F00065 is the Speed Unstable During Self Tune fault, which means that the drive speed is unstable F01000 to F01999 are the Microbus faults, which means that an error occurred on the microbus. F00999 and F02000 to F39999 are the Microprocessor HW/SW faults, which means that microprocessor HW/SW faults have occured. F00066 is the Stability is Less than 50 fault, which means that self tune stability is too low. F00067 is the Stability is Less than 75 fault, which means that self tune stability is too low. F00089 to F00099 is the Fatal Self Tune Errors fault, which means that there are fatal self tune errors.